The French Quarter resonates with romance from every corner, and nowhere is that clearer than at the tables of some of New Orlean's most elegant restaurants. 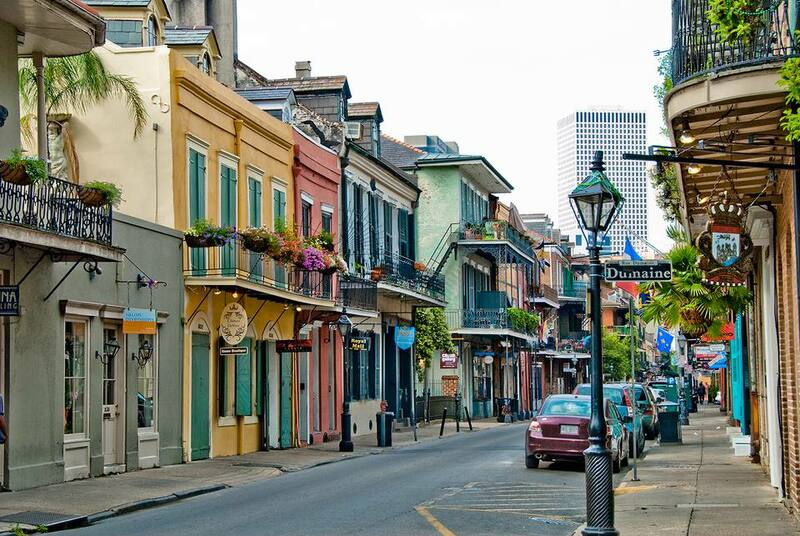 From quiet candlelit bistros to extravagant old-world eateries, calm courtyards to rooms filled with live jazz music, New Orleans' oldest neighborhood offers the perfect setting for nearly any dinner date. In no particular order, the following nine restaurants offer not only romantic ambiance and exquisite service but a different journey into the history and culture of one of America's oldest and most diverse cities. As always, be sure to check local listings and the restaurants' websites for details on making reservations, hours of operation, and seasonal menu changes in order to properly plan your romantic getaway. Explore the flavors of the world through a New Orleans lens at Bayona, Chef Susan Spicer's flagship restaurant where you can either enjoy a table inside the renovated 200-year-old Creole Cottage ​or dine outside in the courtyard surrounded by old brick walls and lush foliage—either way, you're in for a treat! The creative, ever-evolving menu has been one of the city's most lauded for over 20 years, and the extensive and carefully-curated wine list is equally impressive. Be sure to call ahead to ensure you have a table waiting for you when you arrive! Boasting the only publicly accessible balcony overlooking the iconic Jackson Square, Muriel's is quite literally at the heart of the French Quarter. Consider dining at Muriel's and enjoy an upscale Creole meal outside on the balcony or indoors among the gorgeous exposed-brick walls of this nearly 250-year-old building. The courtyard bar offers extensive cocktails and a limited menu, and the seance rooms offer a swanky (and eerie) place to have a drink if you find yourself waiting for a table to open up. This friendly, cozy restaurant boasts a mouthwatering menu of gourmet Italian fare, with a few New Orleans twists and an eye for local ingredients. It's a small place and can be a bit snug, which is not everyone's cup of tea, but it's got a fabulous vintage Italian restaurant ambiance that's nearly impossible to come by these days. Plus, the food is exquisite, so how can you go wrong! Rated as the 26th best restaurant in 2019 on TripAdvisor, this little gem is sure to delight a date of any caliber. Intimate but informal, this sweet restaurant is the perfect date-night choice for lovers who are all about the food—the atmosphere is classy, but it's understated, and Chef Mars' inspired menu is the star of the show. Take a chance and order the "Feed Me" option, where the chef serves up three or five courses of whatever strikes his fancy at the moment. It's an adventure for any foodie couple! If old-world elegance is what you seek, historic ​​Galatoire's is the perfect place to find it. This sumptuously appointed old-line French Creole restaurant has been in business for over 100 years, serving up New Orleans classics like Crabmeat Sardou and Chicken Clemenceau to well-to-do clientele. There's a dress code in effect here (gents, you need to wear jackets), but it's a great excuse for you and your sweetie to get gussied up for each other, and with a perfect location in the middle of Bourbon Street, you and your significant other can venture out after your meal for a nightcap on the town! This charming cafe is a tranquil oasis amid the noise and bustle of the Quarter. With indoor seating in an old carriage house and a gorgeous (and surprisingly quiet) courtyard that's open year-round, as long as the weather's decent, it's a lovely place for a meal. The best part about Cafe Amelie is that the food's as delightful as the setting! The small bistro-style menu changes regularly, but always features locally-inspired fare with meat, seafood, and vegetarian options. A collaboration between celebrity chefs John Folse and Rick Tramonto, Restaurant R'evolution is the place to go if you're really looking to impress someone. Not only does it offer a deluxe menu, it also has a 10,000-bottle wine cellar on-premise offering a wide variety of some of the world's best wines. The menu finds decadent items like truffles, lobster, and osetra caviar sharing space alongside Louisiana classics like shrimp and grits, gumbo, and smothered greens—all updated and fancied up, of course. The decor is subtle, rich, and warm, and even its location inside the luxurious Royal Sonesta hotel merits some ooh-ing and aah-ing. Some young lovers might prefer a slightly trendier, sexier scene for their dinner rendezvous, and SoBou (South of Bourbon) fits that bill. An outpost of the outstanding Commander's Palace family of restaurants, there's tremendous attention paid to detail here, and it shows. The menu is mostly delectable small plates with a Louisiana flair, and the artisanal bar menu will please any cocktail aficionado. A French Quarter staple for nearly 100 years, Arnaud's is the epitome of the classic Creole restaurant offering bow-tied waiters, sparkling chandeliers, flickering tabletop candles, and a lavish menu of traditional upscale New Orleans fare. Arnaud's can feel like a trip back in time, in the most genteel, romance-friendly sense. This is the place to go if you plan on pulling out all the stops to impress your date with a truly romantic evening.